Kensington Gardens is set to host the world’s leading show jumping Championship series in its first ever UK event this summer. Thursday 14th March will be ‘Horse Repair Talk’ night at Dennington Village Hall from 7pm. Speakers include Greg McGarrell from VetCell, Jess Edwards McTimoney Animal Therapist, and Helen Whitbread Equine Vet. Tickets purchased in advance are £8, and light refreshments are included. If you are competing in affiliated dressage, show jumping or eventing and looking for sponsorship, then you could win one of three sponsorship packages being offered by Sue Carson Saddles. One dressage rider, one show jumper and one event rider will each win a year of sponsorship to include: Expert saddle fitting from a Sue Carson Saddles Distributor; Six discipline-relevant training sessions with trainer(s) working with Sue Carson Saddles plus branded goods. 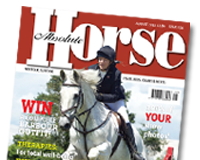 Entry is simple – email your name, address, contact telephone numbers and a photograph, together with no more than 200 words about yourself, your horse, your recent competition record and your plans for the 2013 season to info@suecarsonsaddles.co.uk before April 12th 2013. Introduced in 2010 and now an annual fixture, it is a quick and easy online snapshot survey that is helping to discover more about common health issues in horses, directly from horse owners themselves. Everyone who takes part will have the chance to win some amazing prizes including Olympia tickets, Spillers feed vouchers, or one of six pairs of Ariat Mudbuster boots. Try Before You Buy is aimed at people wishing to experience competitive Endurance riding, and offers free registration for horse and rider to enable them to compete in two competitive novice rides up to 40km before becoming a full member of EGB. The list of rides to choose from is extensive, with 23 regional EGB groups and a busy EGB calendar offering over 100 rides, from February to October, covering all levels. Head of Endurance GB’s PR Committee, Jo Claridge said “try before you buy has become so popular we have decided to continue it for 2013. The number of people wanting to take up Endurance riding is increasing all the time making it one of the fastest growing equestrian disciplines. Many people who took part in try before you buy in 2012 have now taken out full membership for this season”. Para-equestrian rider, Bert (Roberta) Sheffield from Lincs, has received the exciting news that she will now be riding as a member of the Canadian squad for Para-equestrian dressage with her horse, Wonderboy. Bert will be number two in the Canadian ranking system and will be aiming for selection for their 2013 European Summer Tour, US Winter Tour and hopefully the World Equestrian Games in 2014 and eventually the Rio Paralympics in 2016.